Before Execu/Tech will begin installation, there are a couple things that must be done first. You must test and verify that the com ports used by the interfaces are working. We won't troubleshoot your hardware for you. Legacy interfaces must be installed on the computer where the serial cables from the 3rd party system are physically attached, or where you've created virtual ports. Legacy interfaces are run as a Scheduled Task and should always be running, 24 hours a day. If the interface isn't running, it won't work. Some customer choose to run the interfaces on the desktop from a shortcut, often started in the Startup folder. This is not advised. Use the interface program names found on the parent page, here. Running the interfaces via shortcut for any reason other than testing is a bad idea and should not be done! 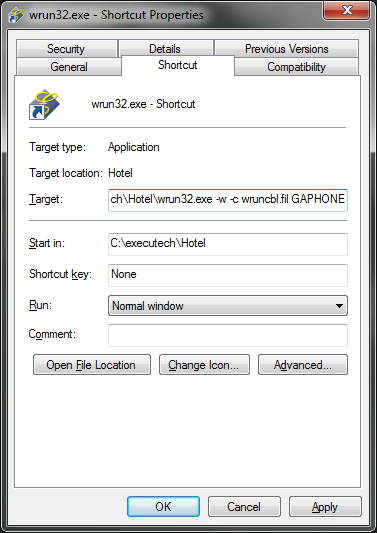 Begin creating the shortcut by opening the Windows File Explorer to the Execu/Suite PMS Folder. Find the file "wrun32.exe", right click it and drag it to the desktop. After dropping the file on the desktop, you'll see a menu. Select "Create shortcuts here" from the menu. You should now see a new shortcut. After clicking OK and saving the changes, right click the shortcut and select "Rename". Give the shortcut an appropriate name like Call Accounting or PBX. For an interface other than Call Accounting, simply replace GAPHONE with the appropriate program name.